Britain has a long history and with it comes a very specific accumulated taste in food. Throughout the years the British people have invented some new innovative food goods that are interesting to say the least. They may not be to everyone’s taste around the globe. But they do hold a special place in the hearts of many UK citizens and appeal to their unique palate. Buffets have become a far spread even on special occasions in Britain. Whether it is during a child’s birthday party or wedding a buffet is guaranteed to occur. Scotch eggs almost always make an appearance at these events and go down a treat with party guests. The egg is covered in sausage meat and bread crumbs. It is then baked or deep fried. Drinking tea is a hobby for many a British person. For some it is even a way of life. Afternoon tea is one of the delights of British life. 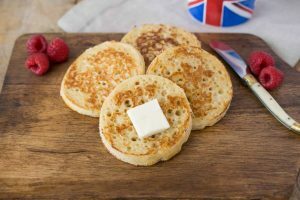 Crumpets have become the ideal food to go with this drink. British chocolate has an emphasised sweetness to it in comparison with its American counterparts. This is down to not including some of the same chemicals used in US chocolate manufacturing. The two processes create chocolates that are so different that many people in the UK can not stand the taste of chocolate made over the pond. These pastry goods can be found in most supermarkets in the UK. However due to a recent law only those actually made in Cornwall can be legally labelled as “Cornish Pasties”. They often contain meat and vegetable. Over the recent years a number of new flavours have began to pop up. However the original traditional pasty is still by far the most popular among meat eaters.